Whether you are coming in a pack or volunteering with one or two friends we have spots for you! What organization doesn’t need to raise money? Does your nonprofit, posse or club have 25 or more members and are looking for a quick, easy and fun way to raise some cash? We got your hook up here at Mighty Mud Dash!! Mighty Mud Dash offers you a Mighty frickin’ good deal! Qualifying organizations that bring a minimum of 25 or more members to volunteer at the event can receive up a $1,000.00 donation to their organization. Simply fill out the Fundraising Application form below and send it to fundraising@mightymuddash.com for your group to be considered! 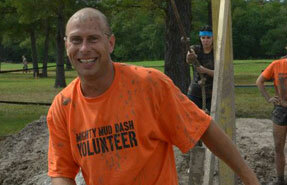 Mighty Mud Dash is not a national series, rather we like to focus more on offering more for our local customers. We like to consider our race an open forum by hearing feedback from our participants and adapting to improve our event. At every race we seem to get tougher & tougher, and bigger and bigger, just like Texas! Mighty Mud Dash gives our participants a life-changing, team building experience that’s just not possible in an in a everyday life. Unlike other races our runners and participants are repeat customers, because they respect our course, our brand and our efforts to answer every customer service question possible. We are about building a local event that brings a change in the local community in a big way. 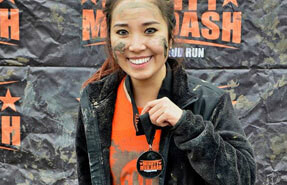 Mighty Mud Dash is a brand you want to be associated with. 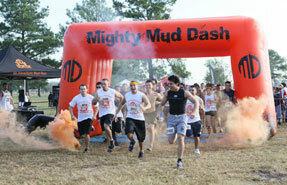 Mighty Mud Dash is on the wave of the new age of event with dedicated athletes and brand loyal consumers. Mighty Mud Dash is part of the world’s most growing sport, obstacle racing. Your sponsorship will go a long way with a growing brand. You can help us promote by downloading our Poster & Flyer and distributing out in your office, local events or any public outing. Want to rock out in front of thousands of crazy mudders? Then submit your application below.